Are you better off buying an established home or a new one? It doesn’t matter whether you’re a first home buyer, next home buyer or a property investor, deciding between a brand new home and an established one is an important choice that every property buyer needs to make. Both choices give you a huge range of options, but it’s a decision that could be very important to your future prosperity. So will you choose a brand new property – perhaps buy one off the plan or build the home of your dreams? Or would you prefer an established home in a location you love? To help you decide which one is the right choice for you, in this article we’ve provided you with five good reasons to consider buying a new build and five good reasons to think about buying an established home. One of the most attractive things about a newly constructed property is that they are brand new. You don’t have to worry that the hot water heater is about to wear out or you’ll have to come up with the money for a new roof next year. Of course, a property with no maintenance issues means no maintenance costs – at least for the first few years – which will be very appealing to landlords everywhere. It’s also a big bonus for first home buyers and anyone who can expect cash-flow to be tight in the first few years of home ownership. In most states of Australia, there are grants and other government incentives to assist first home buyers when they buy a new build home. These incentives may include the first home buyer’s grant and/or stamp duty savings. It should be noted that these benefits do vary from state to state so to find out more, please visit the government website here. If you’re a property investor there could be some tax benefits whether it is a new build or an established home. One of the things you may be able to claim on your tax is depreciation on certain aspects of your property and its contents. These tax benefits tend to be greater and easier to claim on a new build property where the building, fixtures and fittings are all new than with an established property where they may be a number of years old. For more information about how to claim depreciation tax benefits on your investment property and find out exactly what you can claim, please talk to an accountant or visit the ATO website here. If you don’t have an accountant who knows about property investment, just ask us for a referral. People love to live in a brand new property where no one has ever lived before. New build properties make attractive homes because they usually come with all the latest mod-cons, great insulation and the latest energy efficient appliances. You may even find that tenants are willing to pay more rent for a new build property than they would for a similar established home, simply because they know the actual costs of living there will be less. Building your own home, buying off the plan or purchasing a newly completed home may allow you to obtain a home that better suits your needs and lifestyle. It’s a great way to get that dream home you’ve always wanted! Whilst it is often possible to renovate an established home to meet your family’s unique requirements, designing a new one specifically for your purposes may provide better value for money and may be a much more attractive idea to some. Why buy an established home? Unlike a new build property, an established home may give you the opportunity to renovate or extend which could help you to instantly add value and increase your equity. This can be a very effective wealth-building strategy if you do it well. 2. Be sure you’re not paying too much. One of the problems with buying a new property off the plan or building your own home is that it is difficult to know exactly what the value of the property will be when construction is completed. This represents a risk because it is possible that you may end up paying more for the property than it is actually worth. With an established home, it is much easier to obtain an accurate valuation at the time of purchase, so you can be more confident that you are paying the right price. You also get the peace of mind of inspecting the finished property before you buy it. Building a new property depends on the availability of vacant land for the development. This is most often found on the outskirts of cities. Established homes are more likely to be easier to rent and easier to sell because they are usually located in areas where people actually want to live, which tends to make them more popular with both tenants and property buyers. 4. Historical charm and outside space. There are people who love a character home and would quite simply prefer to purchase an older, established home rather than a new build. It can be argued that these homes could have better capital gain potential because they are each a piece of history that is unique and becoming increasingly rare. It is also true that land allotment sizes used to be much larger, providing buyers of older established homes with bigger gardens designed to accommodate families with children and pets. You never know for sure how long it will take to build a new home. Unforeseeable circumstances can often cause frustrating delays and even something as simple as bad weather can add months to the project. On the other hand, you can buy an established home very quickly. The entire process of locating the right property, buying it and moving in could take as little as three months, maybe even less. Whether you’re considering buying a new build or an established home, we’re happy to help you weigh up the merits of your choice of property. We’ve helped many first home buyers, next home buyers and property investors to make wiser property purchasing decisions and of course, choose the right home loan to help them make the most of their personal financial circumstances and achieve their goals. If you’d like to find out more about how we can help you make the right choices, just give us a call today. Andrew Cook is the brand passionate Marketing Manager for Mint360property. With a background in design, Andrew has an eye for detail and a creative flair that allows him to create interesting concepts, ideas and campaigns. 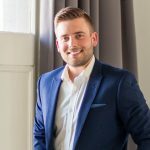 Working previously for a real estate franchise company as Marketing & Design Coordinator, Andrew brings 6 years of real estate marketing and branding experience and looks to take the skills he has learnt into an office environment to grow the brand recognition in and around the Eastern Suburbs area.